If you are saying to yourself, "camo just isn't for me", you are passing up what might just be one of the most truly innovative camo patterns in modern history. Originally designed with Special Operators in mind, the patented camo design is made for function mixing both a blend and a distributive layered affect yet is also fashionable with it's reptilian like pattern. If you are saying to yourself, "camo just isn&apos;t for me", you are passing up what might just be one of the most truly innovative camo patterns in modern history. Originally designed with Special Operators in mind, the patented camo design is made for function mixing both a blend and a distributive layered affect yet is also fashionable with it&apos;s reptilian like pattern. 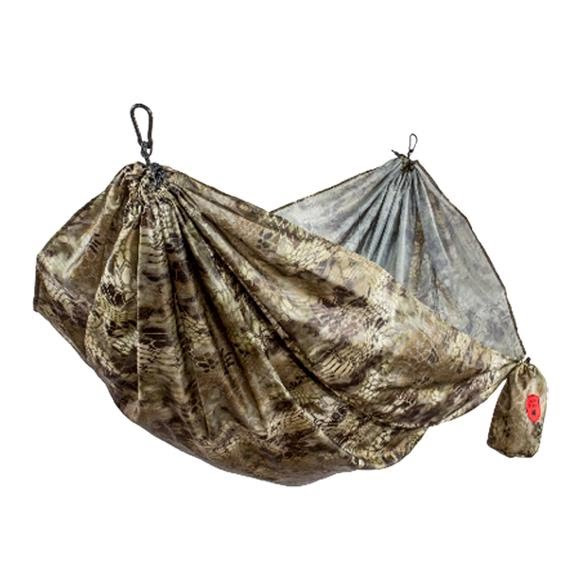 The Kryptek Double Hammock only available by Grand Trunk , is spacious, lightweight, made with a proprietary NO-stretch fabric and at 19 ounces, weighs less than your average camp chair and 1-person tent.